One Bedroom Ground Floor Apartment San Gimignano Il Granaio is a pretty detached cottage on a lovely estate close to San Gimignano, it has a large private terrace with pretty views of the medieval town silhouetted on the hillside and a few steps from the house is a pretty swimming pool. Light and airy, this pretty cottage enjoys a delightful atmosphere. Il Granaio has all its accommodation on the ground floor below there is only a basement floor and at the rear a storage barn. 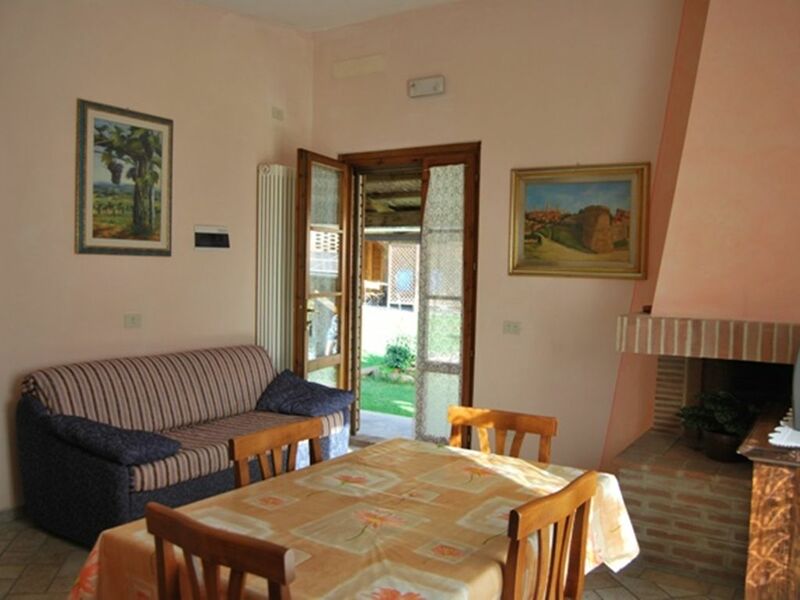 The cottage is comfortably furnished and has a large private terrace shaded by a pergola which to one side enjoys a lovely view across the beautiful countryside to the towers of San Gimignano. The terrace is furnished with table and chairs for dining outside whilst there are sunbeds around the lovely swimming pool (14m x 6m )which also enjoys a fine view. The living room has a traditional wood burning fireplace, glass doors opening on the terrace and a large window also enjoying the splendid view towards the medieval town. A barbecue and a utility room with washing machine are available for communal use and parking is in the grounds near to the cottage. The owner and his family, who are present most of the time, are friendly and helpful whilst not intruding on your privacy. Composed of two traditional Tuscan farmhouses and a cottage, Il Casolare is divided into seven apartments including the owner's apartment, Il Granaio described here, and No 29 Le Volte. Although immersed in beautiful countryside the estate is only 3 km from San Gimignano, and within walking distance of the historic Romanesque Church of Cellole and its stately cypress trees. Only 20 minutes drive away are the Castelfalfi country club with its splendid golf course and San Vivaldo where you will find in the woods ‘Jerusalem in Tuscany’ a medieval reproduction of the sanctuaries of Jerusalem. Just 14km away is the town of Poggibonsi with its rail and road links to Florence and Siena making these famous Tuscan towns easy to visit. 1 shower room with shower cubicle, basin, bidet and w.c.
Notes on accommodation: Heating if used are payable locally according to consumption. Outside: The terrace is furnished with table and chairs for dining outside whilst there are sunbeds around the lovely swimming pool (14m x 6m) which also enjoys a fine view. The owner and his family, who are present most of the time, are friendly and helpful whilst not intruding on your privacy. We arrived at the San Gimignano cottage after a long drive from Venice. Boy were we happy to see such a serene, calm and beautiful rental. It’s neat as a pin with beautiful views of the town of San G from the living room window. It’s close to town but quiet and away from the tourists. The surrounding land of vineyards and olive groves is right out of a fairy tale. The whole home looks to be very recently refinished but keeping its charm. The bathroom and kitchen are super. It’s got all the cookings implements you need to prepare a nice dinner. The shared washing machine is very convenient. The hosts are very charming and eager to please. The bed is very nice. And for the price, it’s a bargain. We had a car, necessary for this rental, and we explored Volterra one day and Lucca the next. There are several restaurants that are very good in San G. We were very happy with our choice. many thanks for your kind review. thank you for your stay .. The cottage is separated from the each other apartments as you write and as it is possible to see from the photos. In the description it is clearly written that there are other apartments in the structure with which it shares the pool. There is no talk of privacy but only of private terrace shaded by a pergola. We believe the description briefly illustrates well the characteristics of the property. We are sorry if you imagined it was a private property but in the description it isn’t indicated. The cottage was lovely. I wasn't aware that this was on a complex with at least 12 other families. The accommodation was fine but we were mislead on the the fact that we were not made aware that the cottage was on a complex with at least 12 other couples / families which lead to the swimming pool being somewhat crowded at times. We were charged 25 euros for a so called cleaning charge even though we left the accommodation clean and tidy, this I feel should only be charged if the place is left in a poor state. The surrounding area was beautiful, the region is well worth a visit. Let us point out that in the description of the Cottage it is pointedly indicated that in the Estate there are another six apartments, we are sorry that you have not read this indication. In high season it is normal for all apartments to be occupied and therefore there may be 12-16 persons in the pool. About the final cleaning costs, they are debited in most of the holidays apartments in Italy and often also in other countries. Also of this you have been informed clearly at the moment of the booking. Even if you have left the apartment in order and we appreciated and thank you for it ,the owners must still provide for the total cleaning including dishes and so on. They are responsible for cleaning accountable to customers . I guess you would not have been happy to know that, before your arrival, the Owners had not carried out a complete cleaning but they had deemed sufficient the cleaning carried out by the previous customers. With all due respect to each client, the Owners can not entrust such a delicate activity to the customers, being satisfied with the good superficial condition in which they left the apartment. First impression of The ‘cottage” although basic it had everything we needed during our stay.and the owners provided excellent service for anything we needed. All towels and bedding were laundered each week and they provided additional pool towels for us. The pool itself was sited in a garden setting and was cleaned regularly and there were plenty of sun beds and umbrellas. The farm location was at the top of a hill and provided great views of the surrounding countryside, and only a short distance from the town of San Gimignano. Our stay at the cottage of Il Granaio was like a slice of heaven. Wonderful location in the most beautiful setting. The owner Rosina is the most delightful lady, we loved her instantly. The property is clean, well appointed and the owners are only too pleased to meet any requirement you may have. Thank you for this gorgeous happening in our life. My wife and I rented an apartment in Tuscany from La Bella Toscana and the transaction was so quick and easy, and the property so lovely, that I just rented with them again. The property was just as descibed and pictured on their website. The cottage as spotlessly clean, well maintained and the kitchen was very well appointed for cooking a nice meal and then enjoying the view of the San Gimignano skyline. It is so beautiful, quiet, and restful, that we eager to retlurn for another delightful week. Nearest beaches approximately 1 hour 15 minutes drive away. The town of San Gimignano and its shops, supermarket and restaurants is aprrox 4km away. Main towns can be reached by local transport (bus and rail). The Tuscan countryside and smaller towns are more easily explored if you have the use of a car. San Gimignano 4km. Siena 35km. Florence 50km. Pisa airport approx one and a half hours drive. Florence airport approx one and a quarter hours drive. Rome airport approx three hours drive. Nearest rail station Poggibonsi 12kms. Bus connections from San Gimignano. Full selection of amenities, shops, supermarket, banks, chemists and restaurants all available at nearby San Gimignano.